Modern Coast Ltd resumes its night travels some few days after high court temporarily lifted the night travel ban imposed by the NTSA to long distance PSV's. The announcement of the ban was made on the eve of New Year after a fatal crush between a bus and a truck at Migaa area claiming a number of lives. Modern Coast through its facebook page has now announced to its customers that it resumes its night travel. 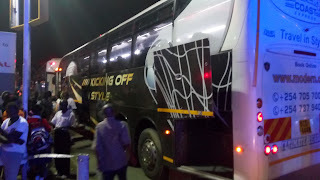 This move by Modern Coast has come as a surprise as many expected the ban to end two weeks after Transport PS Paul Mwangi in a meeting assured drivers that the night travel ban will be lifted in two weeks time. The night travel ban had affected both bus companies and travelers and many considered it discriminatory as it only affected long distance travelers. Book now with Modern Coast and enjoy the long awaited night travel. Bus Kenya, We Will Take You There..